Salesforce.com Configuration Services Salesforce.com delivers professional services and application training through Successforce Consulting and a network of partner organizations. A popular suite of support programs entitled “QuickStart” provide help for both new and existing customers. QuickStart Optimize: A remote or on-site service that helps existing customers configure the application to address their key business processes. Salesforce.com will also provide customized services to support larger projects in addition to their “Success Coach” - an online program of support offered to Salesforce.com customers with 10 or fewer users. Beyond application configuration Salesforce.com offers separate packages to support data migration for organizations of less than 50 users. These packages represent the classic migrations from competitive solutions (Act!, Goldmine, MS CRM and others). These services are reasonably priced between $2500 and $4500. Incremental test data migration imports beyond the single import provided in the package. 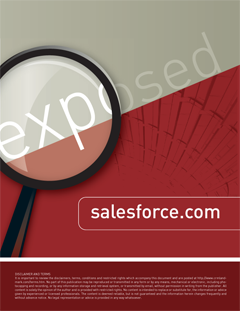 For implementations beyond 50 users a customized service proposal would be crafted by Salesforce.com. Salesforce.com provides an outstanding lineup of web-based training materials that include a comprehensive online help manual, tutorials and best practices. The web-based training courses are well put together and easy to follow (if not just a little too slow for this user). Salesforce.com will customize training materials and craft a separate training program based on specific needs, for a fee. Salesforce.com has recently added a full certification program for Administrators offered through a series of publicly available seminars starting at $3000. Salesforce.com offers unlimited case support for all editions. Response time (not resolution time) is guaranteed within two business days. Live phone support is available but the hours depend on the edition purchased – with basic support (standard for Group, Professional and Enterprise) the hours are 5 days a week at 12 hours per day. Only at the Premier Support level is live phone support available 24/7. Premier Support is also given priority queue routing and toll free access. Customers are also given access to the online self service portal that allows cases to be submitted online and subsequently tracked.